As I sit here, before the altar of the internet on my re-purposed kitchen chair, the sensation of the positive clicks of the ergonomically curved keyboard under my fingers remind me of times when coding was my life. It’s been over a decade and a half since I last made my living solving interesting technical problems and making those newfangled PC thingies do stuff nobody had ever done before. You know – back when people listened to music on CDs, and you could make toast with the hot air coming out of the back of your desktop PC. I’ve been fortunate enough to have enjoyed (at least on occasion… like pay day) a long and storied career since then. After moving to Canada I changed tack, started my own company, then began a whole new arc of learning and personal development as a Product Manager. As I look back at the experiences and skills I’ve picked up along the way, I’m actually quite proud of how much I’ve developed – and equally humbled by the time and effort others have invested in me along the way. Today, I sit at the cusp of another big life vertex (or is that “vortex”?). This time one thrust upon me by decisions made at a senior level in the company that (at least for now) employs me. As a result I’ve started to look at job postings with something more than the furtive glance that men normally reserve for when they are forced to walk past Victoria’s Secret… or worse: sit outside the changing rooms turning steadily crimson. And so, as I read these job postings, I look at them with different eyes than I might have done in the past. I look at them with the eyes of a Product Manager – market and customer aware. Thinking how they are being received, for, as mentioned, I am now potentially an actual customer myself. We need an X. An X in our company is expected to A, B and occasionally C. You should be able to D and E and ideally have experience F-ing. But these are strange times. Worse… I live in greater Vancouver: a place that thinks it is so cool, it hasn’t noticed all the grown-ups sniggering at it. I will not pick on any specific company (especially as I need one of them to help pay my mortgage), but I do not exaggerate when I tell you that senior positions often require the applicant to have a whole 2-3 years’ experience. Surely these applicants must truly be sages having lived so much of life! They can’t help but have seen a whole raft of projects begin well and then unexpectedly head somewhere dark and unsavoury, only to be redeemed (or perhaps not) by their steady leadership and perceptive solutions. They will be able to bring the learning they’ve taken from these experiences – good and bad – and apply them to the exciting projects these new postings offer. Yes… that is sarcasm. But I’m only just warming up, please stay a while. In a world where the job’s challenges are no longer a sufficient attraction (I know of a case where an applicant asked what the next job would be in 2 years’ time – bluntly acknowledging that they had no intention of staying in the role any longer than that and were shamelessly expecting promotion within that time-frame), this new breed of technology company must offer additional inducements. And here, I assure you, I do not exaggerate: I have seen job postings offering “endless Perrier”; “gourmet coffee”; “fresh organic fruit”; “chill-out area”; “awesome views of the North Shore Mountains”; “office dog”, and my favourite so far – “massage chairs”. More than you might suppose actually list “paid leave” like this is an unusual thing to expect. This is definitely not your father’s job-hunt! I admit though, I have also seen one casually mentioning “unlimited vacations” like it was a perfectly normal thing. But I fear Canadian holiday allowances must wait for a separate rant. But back to my point – the marketer’s eye. If you’ve never read The Prince by Niccolò Machiavelli, you should correct that as soon as possible! It’s pretty much a standard text for business courses these days, but it’s an interesting read in its own right. Anyway, though it has many keen observations of human nature and how they might be, er, tuned to one’s advantage there is one in particular that I remember. To paraphrase, it is essentially “perception is everything”. Reality is one thing, but people are driven by their perceptions of a situation. So grab any marketing professional and they will tell you that every touch-point your company has with the public is an opportunity to create perceptions of the brand. That’s why so much time and effort goes into those “style guides” – so many mm between this word or logo and surrounding text. Make sure the colour is Pantone whatever, and not just any old red. They seem petty, but they’re protecting the brand – ensuring those perceptions are carefully controlled and manipulated. Imagine then, when it comes to job hunting. You peruse the offerings one day, maybe see one or two opportunities with interesting challenges (and offering your brand of fizzy dog, or whatever floats your boat). You may even apply. As quartz crystals moderate and measure the wibbly-wobbly flow of our lives, you might find yourself re-visiting those same cul-de-sacs of the interwebs a few days later. Perhaps several times over the space of a few weeks. Months even. What then is your perception when you see those same opportunities being offered? Sometimes still offered. Sometimes re-offered, with a new posting date, but otherwise identical. I tried really hard, but the only positive interpretation I could think of was that they might be growing so fast that they actually still need more people for that role… which might be true of junior roles, but not ones with labels like “director” or “VP” in the title. So – the perception I personally am left with (and you may perceive otherwise of course) is that pretty much any of the possible reasons for lengthy or repeated postings of the same role means this company has a problem, and maybe I’d be best avoiding it. Worse… I might tell anyone thinking of doing business with them that they seem to have a problem recruiting staff, so perhaps they’ve got a limited shelf-life. Extreme, I agree – but perceptions are like that. Now… if there’s a path to the public with that much power to modify perceptions of the company, wouldn’t you want your marketing group to have a say? I was appalled to read this on the BBC. Personal politics aside, this showed a huge lack of empathy for the wonderful people of Durham and its surrounding area. 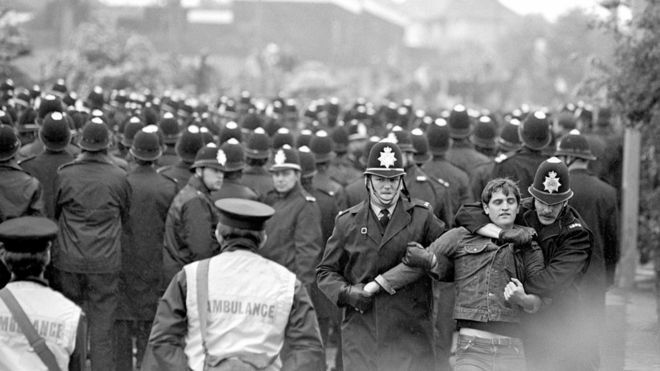 I was fortunate enough to be a student of Durham, and was actually studying there during the miners’ strike. The population of the city pretty much doubled during term time and despite the attendant distortion of the local demographic, I never found the “townies” to be anything but friendly and accepting of the “gownies”. Along with many other students I volunteered in the community and tried to “give back” a little to my host city during my stay. The strike heightened town/gown frictions to be sure. I believe there may have even been a few beatings of students – presumably those showing their unjust entitlement a bit too readily. For a group of today’s students (admittedly rugby players – rarely the brightest bulbs) who weren’t even born at the time to be so disrespectful of the city’s social history and its positive interaction with its transient student guests was shameful. Back in the ’80s Trev’s college was female only and a much more thoughtful place. Higher education is a privilege and its recipients should be more grateful to the wider community that makes that learning experience possible. Many in that community do not have the same access to that privilege yet still add to the positive experience students graduate with. I hope to read soon about a complete and unreserved apology from Trev’s rugby team – hopefully accompanied with some community volunteering to help redress this ill-considered move. Today I got to spend an hour at Vancouver’s amazing Museum of Anthropology. An hour is nowhere near enough time to see everything – 90%+ is hidden in the hundreds of drawers that nobody ever seems to think to open. An hour is plenty though – you’re already suffering from sensory overload by that time. It’s been a while since I last visited and this time I was struck by a few life-size art pieces titled “body map”. Next to each was a brief piece by the artist. This one almost made me cry. So full of hope and life, but the footnote reported the brutal killing of the artist at the hands of someone she should have been able to depend upon. One of the women artists from the Bambanani Women’s Group, who went on to work on the Longlife Project, which raised awareness and campaigned for antiretroviral treatment to be made available in the South African public healthcare sector. The Longlife Project recorded the life stories of the women who were participating in a Médecins Sans Frontières (MSF) pilot antiretroviral programme. Life sized body maps were created and published in the book Longlife: Positive HIV Stories together with interviews of people working on the project. 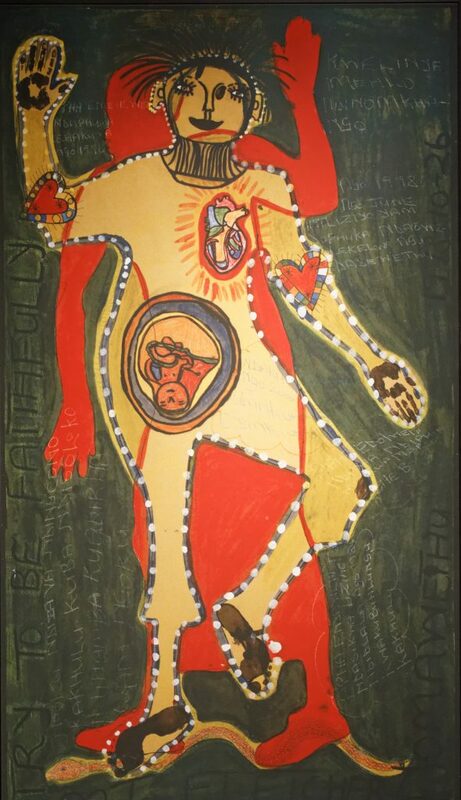 Limited edition fine art prints of the original body maps have been exhibited locally and internationally at conferences, fundraising events and in art galleries. The Longlife Project marked a shift from ‘preparing for death’ with the creation of memory boxes to ‘fighting for life’ as antiretroviral therapy was made available in public clinics and hospitals in late 2003. After the Longlife Project the Bambanani Women’s group went on to be trained as field researchers and worked on surveys conducted by the Centre for Social Science Research at University of Cape Town. Some members of the group have continued to do Memory Book and Body Map workshops and presentations for organisations such as VSO, Tateni Home Based Care, Red Cross, Médecins Sans Frontières and medical students at the University of Cape Town. A photo of Nomawethu’s words is here. I’m standing with my hands up and my feet on the snake. In my opinion, the virus looks like a snake. You can’t see it and it’s moving in the secret ways and dark ways. Inkanyamba, a big snake that lives in the water, a destroyer like a hurricane that destroys everything on the earth and makes houses and trees fall down and kills people. But you see I am standing on the snake. With ARVs I destroy this virus too. Others did not give me a lot of support when I found out I’m HIV positive. I live with my father, a drunk person. I won’t disclose to him and I haven’t told my boyfriend either. Maybe he will leave me even though he gave me the virus. 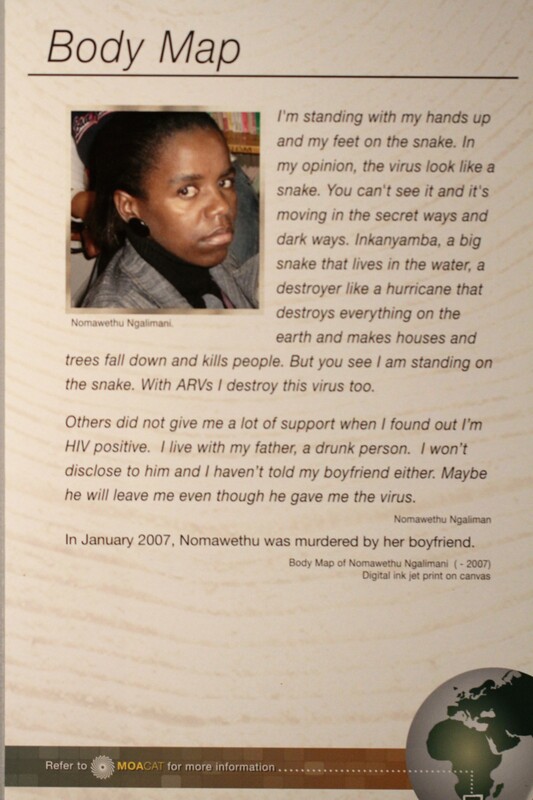 In January 2007, Nomawethu was murdered by her boyfriend. You can read a little more about this remarkable woman and her murder on 50.50 by Kylie Thomas. (Almost) finally, here’s an image of the body map she created for the project. (Really) finally – consider looking out a copy of the book – LongLife: Positive HIV Stories (Cape Town: DoubleStorey Press, 2003). Nomawethu’s image is on the cover. Due to reasons beyond my control, I was persuaded to succumb to a Facebook account. One of the feeds I subscribe to is “Destination British Columbia” which often have some lovely photos of my home province and occasionally introduce me to places I haven’t heard of. They ran a little puzzle asking people to identify where a photo was taken, and the answer – as the more quick witted amongst you will already surmise – was Cascade Falls near Mission, BC. I’d never heard of it, so off we went to explore a little corner of our province we’d never visited. It’s about an hour’s trip from White Rock, but the petrol is so cheap in the valley, I think we still came out ahead! We stopped off for an almost Yorkshire lunch at Clayburn on the way, complete with gallons of Taylor’s tea, and easily found the provincial park just beyond Mission. The waterfall is certainly spectacular, and it’s only a 5 minute walk from the car-park. Disappointingly though – that’s it. No longer walking options; no trails through the forests. There’s a picnic area to be fair, but nothing more strenuous than the wooden stairs up to the viewing platform. If you’re passing though – a lovely stop-off, but don’t make a day trip of it on its own. 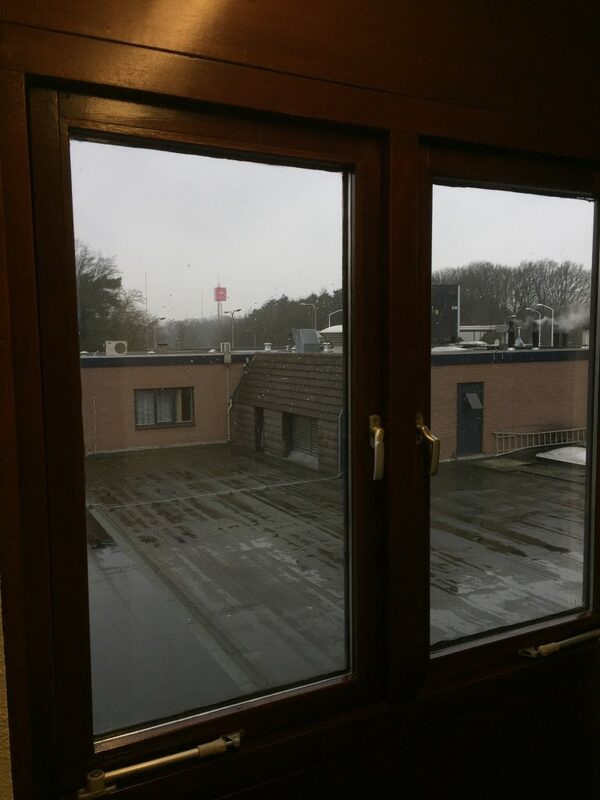 So I recently returned from a week or so in The Netherlands. It was a business trip to Venlo, but as I was there for a little while (including a weekend) I got to see a bit more of the place. “Océ – a Canon Company” has its headquarters in Venlo, just over the border from Dusseldorf, the nearest airport. I learnt that Venlo is actually from the dutch “ven” meaning fen or marsh – indicative of the typical dutch geography. I won’t bore you with the work-related reasons for my trip, but allow me to indulge myself with the more culinary and cultural elements of the visit. I arrived on the Thursday and met up with a colleague who introduced me to an app called “untappd“. Basically this is like a boozy version of Pokemon Go or geocaching or I-Spy or something. Essentially you log each beer you imbibe and it allows you to discover similar beers you may enjoy, or nearby hostelries selling your favourite tipple. The Netherlands, like nearby Belgium has a long history in beer brewing and it was an easy excuse to try and “bag” as many different tipples as I could. And by tipple I mean “Tripel“. I was a bit jet-lagged on the Thursday so just had a swift pint in the hotel and a burger with my Romanian colleagues who’d flown in a little earlier. 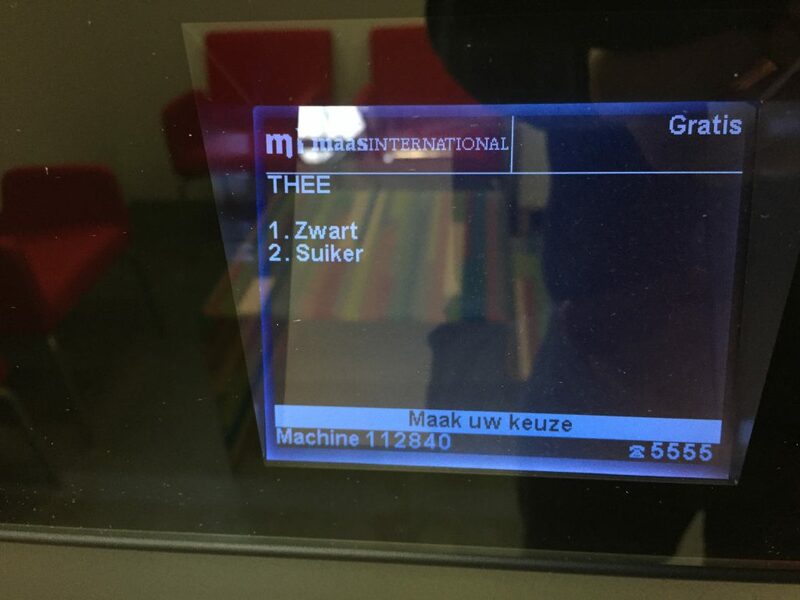 Friday, I went to work, and got confused by the tea machine. The options were “black” or “with sugar”. Not black/white or with/without sugar you understand… I found my inner calm and went with black. The red Océ sign out of the hotel window. Your options are black or sugar. That is all. One of my colleagues is a bit of a fitness addict so we didn’t get any other offers to join us for a brisk walk into town. It’s about 35 minutes each way, but I needed the leg-stretch, and it helped build up an appetite. We settled on Alde Mert and were not disappointed with the victuals. 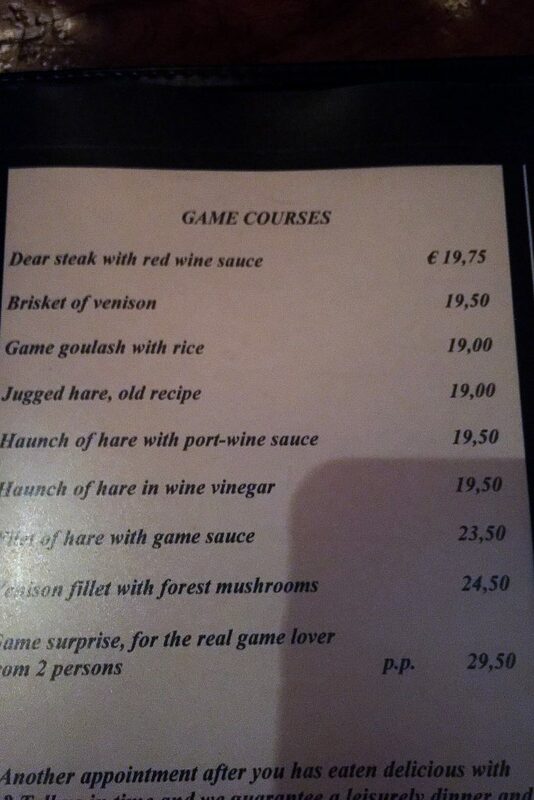 The menu included “game courses” and though these did not include such favourites as “Monopoly” they admitted the pricing was a tad rich by referring to “dear steaks”. 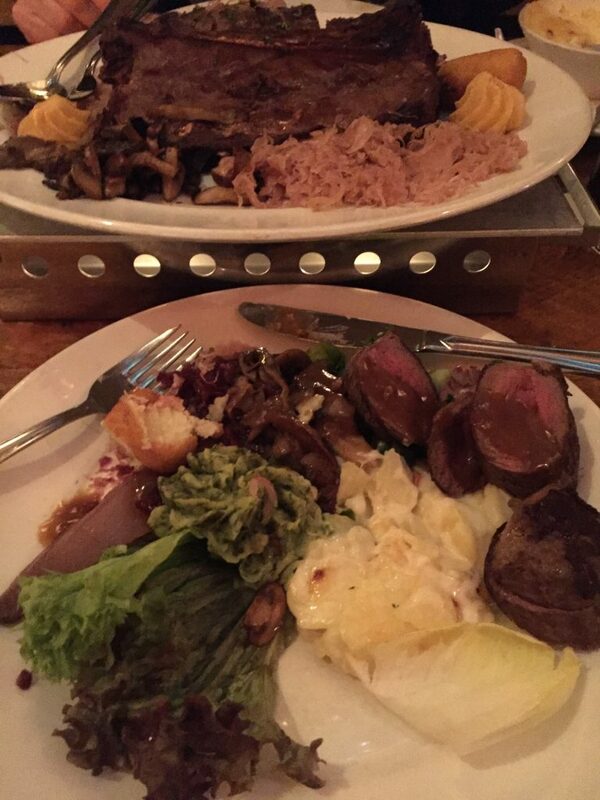 The steaks were “dear” it seems. Bambi’s mum did not die in vain. We walked a little further to Cafe de Klep (“the valve” or “the tap”) with its beer menu of over 100 offerings. Westmalle, Karmeliet and Kwak seemed appropriate. Small 300ml litre bottles, but with a ~9-10% punch. That’s like drinking wine in beer quantities. 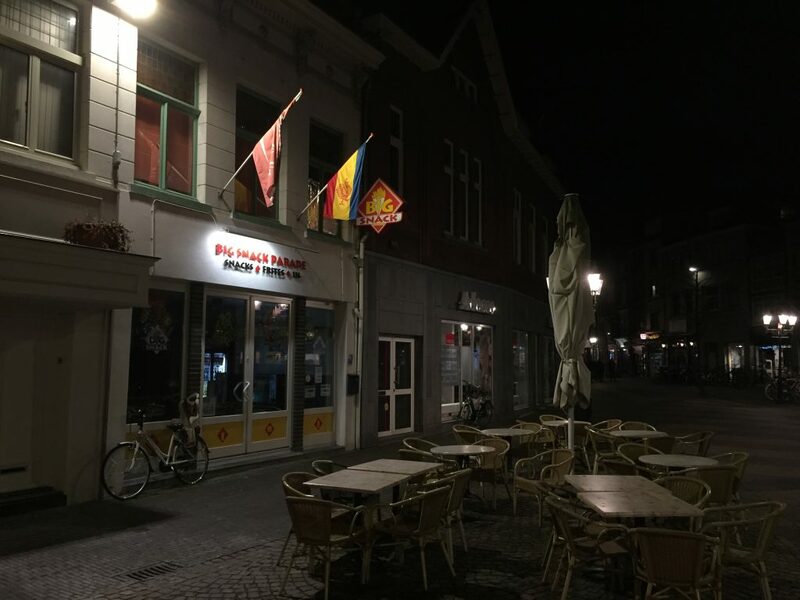 No wonder the Belgians and Dutch are so mellow! Kwak is always amusing. I first came across it when I travelled to Antwerpen a lot with Agfa. It comes in a glass with a round bottom and is supported in a wooden frame. Some bars insist you trade a shoe for the glass to ensure you don’t leave the establishment with one of their unusual glasses. A quick walk back to the hotel through the sleepy streets of Venlo and a sound night’s sleep ready for the weekend. After a little debate, we decided we’d spend Saturday sight-seeing and opted for a trip to Arnhem famous for Operation Market Garden, immortalised in Cornelius Ryan’s A Bridge Too Far, turned into a film in the 70s. I had a personal connection as my grandfather had fought there and survived the ordeal. The airborne museum at Hartenstein in Oosterbeek was very well done and had a solemn but informative air. Next we went to pay our respects at the nearby airborne cemetery. I was surprised to see several Canadian graves and all the ones I found were glider pilots – none over their mid-twenties. They came from the skies. Operation Market Garden was the largest airborne assault in history. Somewhat subdued, we headed back into Oosterbeek for lunch. After walking the length and breadth of the little town we settled on The Grand Cafe Schoornoord. As with so many places around here, it had its own links to the battle and had been used as a field hospital. First opened in 1882 it saw 500 wounded British soldiers treated inside during the battle of 1944. It’s now affectionately known as “Airborne pub No. 1”, and seems very proud of the small part it played in events. The menu is proud to remind visitors of the part played during the war. 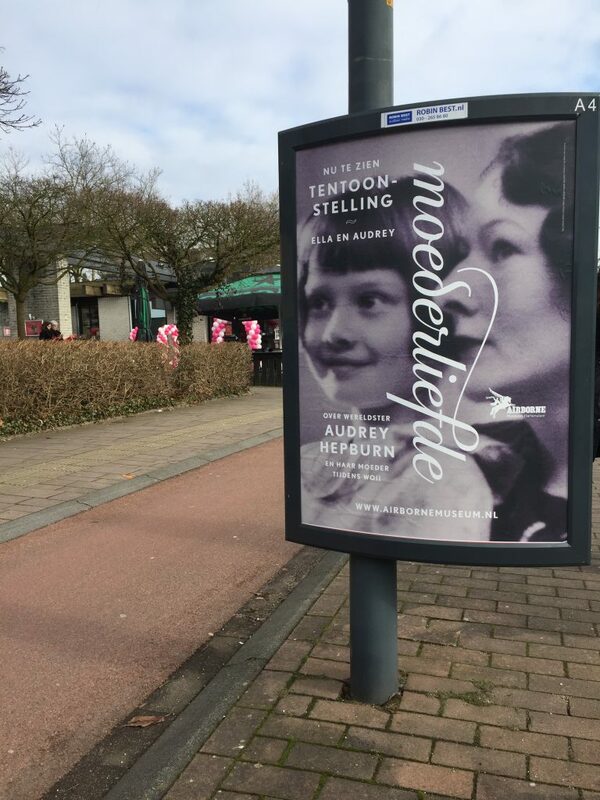 Regular readers will know of my affection for Audrey Hepburn, and though the museum did have a temporary exhibition of some of her early life, I actually found this street advert in Oosterbeek to be more powerful. The eyes and cheekbones are unmistakable, even at such a young age. Note the pegasus symbol of the British Airborne Division on the lower/right of the poster. After the drive back to Venlo and a while to regroup, we headed into Brasserie Alt Arce in Arcen (yes that’s really its name, and you say it like you’d think!). The food was excellent and beer was most naturally drunk. This Grand Prestige is a “Quad” beer. Not for the faint-livered. Sunday was quiet and we headed off to the Hertog Jan brewery to sample their wares at lunchtime. I love the unfussy dutch food in this region and had a lovely “blood pudding” for my lunch. Essentially “Black Pudding” as it would have been in Yorkshire, but lightly fried. Back Pudding like you’ve never seen it. Wonderful! The 11th Commandment: Thou shalt drink! By evening time we were looking for something a little closer and headed for the short walk from the hotel to Taurus. More beer – it was almost becoming habitual, but still easy to try different brews. By Monday I was on a mission, and even though we ate in the hotel, I managed to add a few more different beers to the tally. The main event began on Tuesday and I was now swept up in the formal mass dining of the group. 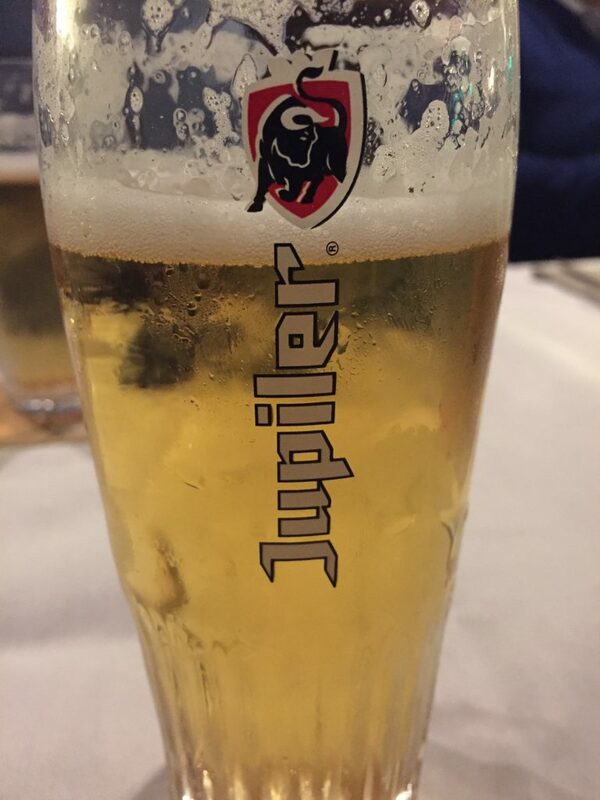 This severely limited my options and Tuesday only added one new beer – Jupiler. Another Belgian mainstay. Wednesday saw us back in the hotel “en masse” and I added one more Trappe to the total before being part of the winning team in the “team building” event. By Thursday evening everything was done, and a few of us grabbed a taxi down town and ate at the Cafe Central. We finished off at the Klep again and then headed for the train station to grab a taxi back to the hotel. The Klep had some interesting urinals of the type first tried at Schiphol. The psychology goes that if men are given something to aim at, they’re less likely to pee on the floor, and so help keep things a little less smelly and icky. Get the fly! Cleaning the floors in public washrooms is easier when men are encouraged to aim better. A few bikes in the rain, at Venlo station. Yesterday I took my son and one of his mates snow-shoeing up Mount Seymour. Dog Mountain specifically. We were a bit late getting there so we were treated to a lovely sunset when we got back. I love it when the snow is still fresh and forming unspoilt mounds on rocks and trees. 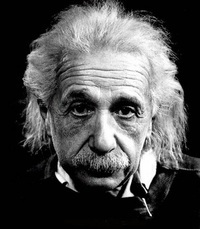 Did Einstein really illustrate relativity with an easy to grasp example? The quotation in the paper was not directly from Einstein. The reporter simply noted that the tale was being circulated. It seems fake news is not new news. For a full analysis, check out Quote Investigator.